Cytochrome P450 (CYP) are enzymes responsible for the metabolism of most drugs by our liver. They use large molecules as substrates to create other metabolites using their enzymatic reaction. Laboratories that work in drug discovery rely on CYP inhibition assays to identify potential drug-drug interactions with their new candidate. Some drugs may inhibit the other’s metabolism while other drugs may enhance the reaction to the drug. In the latter case, the reactions may cause grave damage to the liver or be fatal to the user of both drugs. More than 50 000 CYP proteins were identified which gives scientists a whole lot of work when conducting these assays. A probe substrate is introduced into a solution of human liver microsomes (HLM) which contains the enzymes. The reaction of the substrate with the enzyme has a known result, for example, CYP1A2 with phenacetin produces acetaminophen over time. To this, they add their new candidate or inhibitor. Using an analysis method, like LC-MS/MS, they determine the concentration of the monitored metabolite found in the sample. They can thus create chemical kinetics graphs. This result is then compared to a vehicle control to calculate an IC50 value, which gives the potency of the new candidate to inhibit half of the enzymatic reaction. Since 2007, Phytronix has developed different sample preparation methods with the LDTD® technology to determine CYP inhibition while diminishing the analysis time in this field. Many different technologies were used to deposit the samples and to analyze them. The most noteworthy of these combinations is a Luxon Ion Source® in tandem with a Sciex 5500 Qtrap® mass spectrometer and a Labcyte Echo® deposition system to transfer 100 nL of the sample preparation into a 384-well LazWell™ plate. This combination has permitted the assays to be done in 0.91 seconds sample-to-sample using the multiplexing of three different CYP assays. This approach has given similar results to the individual analysis of each sample. 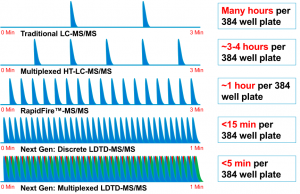 The slide below was extracted from an oral presentation Andrew Wagner from Bristol-Myers Squibb gave during SLAS 2016 which proposed the LDTD® technology as a Mass Spectrometry-Based Plate Reader for HT-ADME and other HTS Applications. Since then, Phytronix has released the Luxon-1536 model, which permits laboratories to use 1536-well plates and achieve even faster results, and thus became a game changer in the High-Throughput Screening field.